as I mentioned in my previous post I've been doing a little bit of crochet this week. On Saturday , while the snow fell, I enjoyed playing around choosing jolly spring colours. Ohhhhhh lovely :0), sometimes the simplest ideas are the best , don't you think. The first time I made a bird in this way was following Lucy's wonderful tutorial HERE. My version just uses a smaller circle. They are super quick and simple to do . Here's how ........... First pop over to my Owl tutorial HERE and follow my photo tutorial on how to make these modified sunburst granny circles. Once you have made at least one pop back here . I then attached some really small buttons, one on each side of the folded circle, for eyes . I made a couple of wings from felt in a teardrop shape, which I embellished ( love that word ) before sewing to either side of my bird. Next I made a beak by folding a triangle of felt in half . I sewed it in place as I sewed the two halves of the bird closed with some matching thread. I started sewing at the beak and did a small running stitch close to the edge of the semi circle, through both sides. Then there was just the tail tuft to add ,it's made in the same way as my owls ear tufts , so you can copy my instructions over there if you are unsure....again it's really easy. I really enjoyed making these little cuties, I think they are perfect for Easter , but also great for any time you want a bit of crochet fun. Each of mine is embellished in slightly different ways.....I love them all and hope they have given you some inspiration for making your own variations. I realize the sewing bits of this project don't have detailed , step by step pictures, but hopefully my description and pictures are clear enough for you to follow , it's a very flexible project so there's no wrong way ....just experiment and see what works with what you have. I really like your cutebirds. Squeal - gorgeous! I'm inspired - kids' names stitched on wings. Love it, thanks! Hell dear. Those are the cutest birdies! A perfect project for my oldest daughter. Thanks for the tutorial. Oh and my blanket looks lovely in your post!!! I am sure it has ended up there by accident... Ha ha ha. I got very surprised when I saw I though... A bit weird. For a second a thought it was my blogpost... Happy Easter! Oh how cute are they??? Definitely a must-make!!! Thank you! What a great idea. I've made the same little birds but I used felt. I'm new to this and wondered if anyone can tell me why my comment says Reply and Delete under it and every one else's just has the word reply. I also would have sent a LINK to my little felt birds just incase anyone would be interested but i'm not sure how to do it. Oh, I just noticed it's been a bit over a year ago since this post...LOL. Anyhow, if you never found out what it means, I think it has the 'delete' only on our own so that we can delete our own post if we choose to, like if we made a mistake on it or something. Only reply under other people's posts so anyone can 'reply' to that post. Hope that made since. :) But then, you probably figured it out by now...LOL! Simplest projects ARE the best. These are genius and so adorable. They are really very nice! How pretty! They really do celebrate spring colour and Easter goodness. I like the way your birdies look great when viewed from above as well. Oh! I just love these colourful birds! 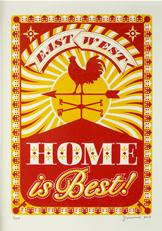 Thanks for showing us how... just what we need to bring spring into our homes. Lovely Easter corner and decorated branches! What a great idea. I really like them. Thank you!i like very much! Really cute! I love the different details on the wings. I will try to make some myself... Thanks for sharing! Thanks for sharing the tutorial!!! These birds are just so adorable, thank you so much for posting this great idea. Your little birds look lovely! These are so cute! I am definitely going to make some. Your tutorial is very good, and I love the colors you chose! Your little birds are just lovely! I love the colors you have used and the felt for the wing and beak! I am definitely going to make a few - I don't think mine will be ready for Easter but perhaps spring. Especially with its oh-so-slow arrival! My garden is still covered in snow! Hi Jacquie! 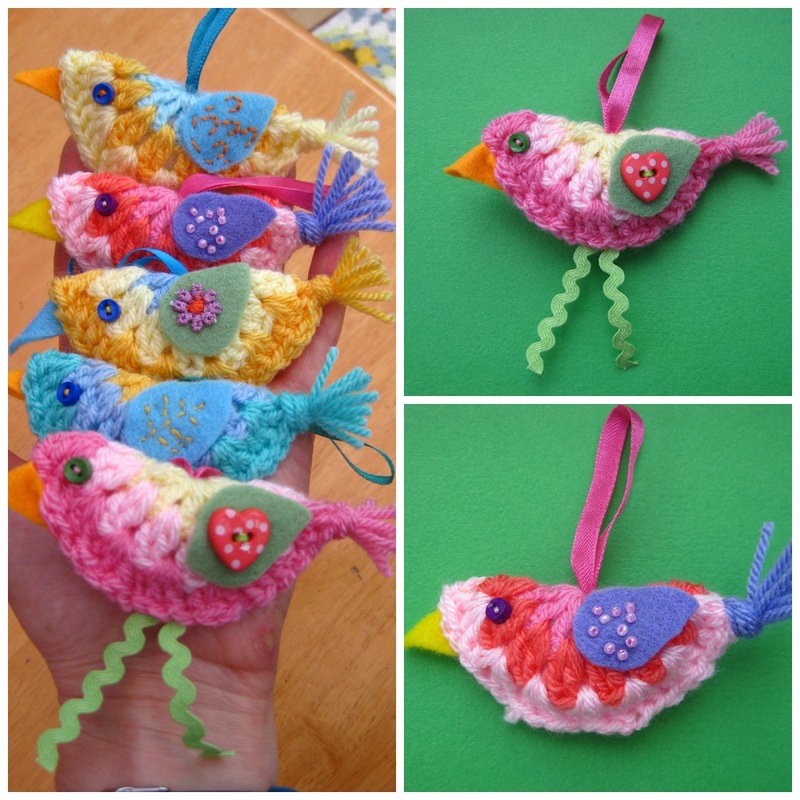 Love those little birds full of Easter joy, might look good hanging in the garden too! Such Easter cuteness! I love the ricrac legs.... I think if I get chance and make one I'll put a bead on the legs as well! Excellent, I have been toying with the ideas of making some birds recently, let you know how I get on! Your beautifully hued Easter birdies are adorable. I particularly like the choice of the felt beaks, and that each one of these cuties if unique. I love your simple and colourful ideas Jacquie!!!! this is really cute and I have a lot of crocheted circles done, waiting in a box for a beautiful project like this one!!!! OMG - so cute! I am making many!!! Sweet little spring birds, very cute and colourful. ah - just love them! your birds are sooo sweet looking! Happy easter! A great tutorial and clever use of crocheted circles! I just made one. I love them. Going to make more later. Thank you so much. 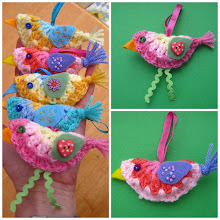 These little birds are adorable and goning on my listof things to make. These are so cute that I had to make some !!! Love the Owl too !!! Thank you for sharing this nice tutorial . Happy Easter ! Really love your Easter display, nice to see your crochet bunnies again too! They're so cute, simple but effective! Ohh I love your birdies, they are so cute. I'm new to crochet, so fingers crossed I'll be able to do these. It's projects like this that inspire me to learn crochet and to learn more stitches. Oh gosh, these are just adorable, I think I'll have to make a lot of these too. I've already made lots of your owls! Muitas sugestões, parabéns pelo seu trabalho amiga! love your site, just made your crochet owl (-: now I start with the birds. Hi , Jacquie !!!! I am a new follower - I love your creations !!!! I have posted about your crochet birds and owls on my blog today - your tutorials are excellent !!!!! Great idea! I was looking for something new to make for Easter and here it is! Made some already, brilliant idea and so easy, thank you. Such cute birds and easy to follow instructions. Thanks for sharing this simple pattern. Made three of them in different colours.